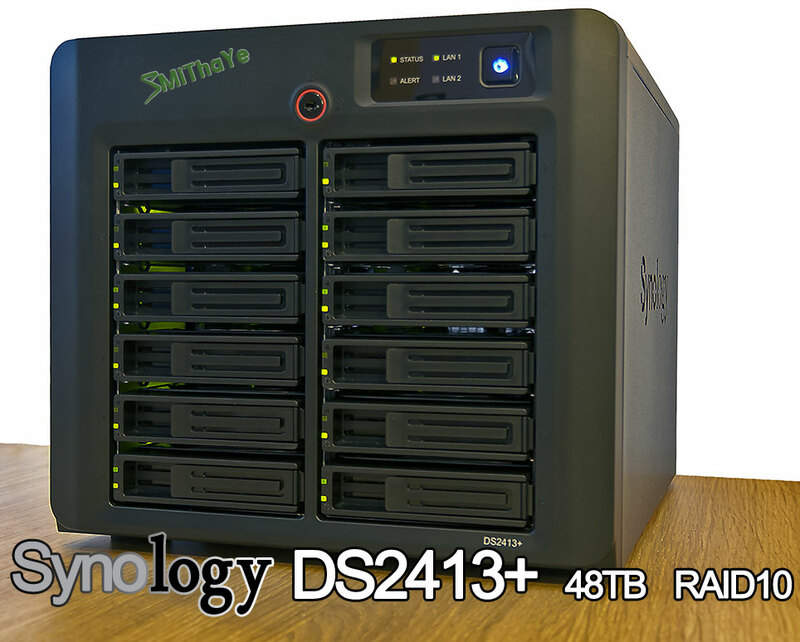 This NAS can use 4TB HDDs and maximum capacity is 48TB in this unit but can be expanded to 96TB with the addition of DX1211 which can connect via an Infiniband cable rated at 12 Gbps. It has a ton of features and its short-term limitation would be the energy efficient 2.13GHz Intel Atom D2700 2C/4T x86 Cedarview and currently has 2GB DDR3 1333MHz RAM (expandable to 4GB) powered by a 400W PSU. Fine for general usage but add in transcoding over the network for video/audio files and it will get a good workout. All perfectly manageable and doable over my 300Mbps WAN. Potential speed over link aggregation, dual Gigabit LAN, is 201MBps/196.87MBps read/write. Once the volume is configured to RAID 10 via the legendary DiskStation Manager it will be using a single Cat5e to my router and the other will be used to access media in our living area. 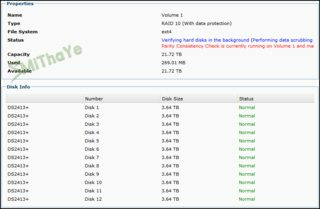 Disk are hot swappable and NAS has plenty of volume types to pick from. On the back of the NAS there are 2x USB 3.0 ports, 4x USB 2.0 ports, and an expansion port called Infiniband. Power consumption is rated at 111W under load and 41.8W with HDD hibernation - I will test this with my plugin monitor based on the HDDs below. 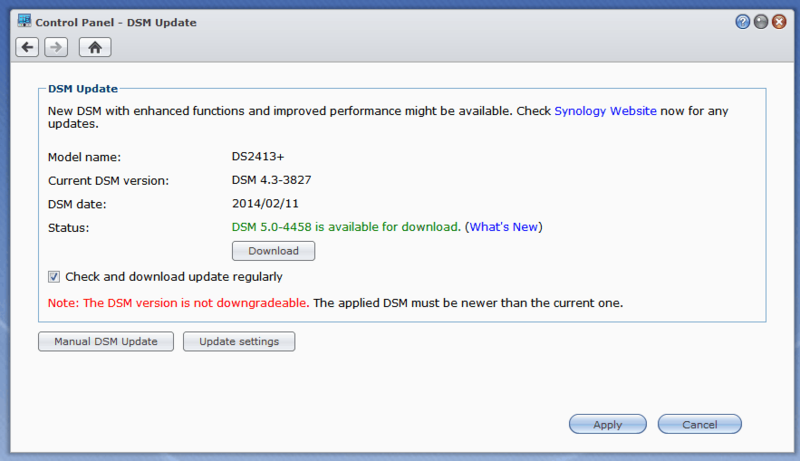 Noise is rated at 21.5 dB(A) and have to take Synology' word for it. HDDs are cooled by two 120mm exhaust fans (each cools six drives). Without HDDs installed it weighs in at 9.93Kgs, the twelve 4TB HDDs weighs in at 7.3Kgs given a total of 17.23Kgs of a workout to move. Currently the NAS is on the desk because I can't think of a better place to put it. The size was a problem because its much bigger than my AVR in living room and that just about fits in the cabinet, height/width/depth 27cms x 30cms x 34cms. 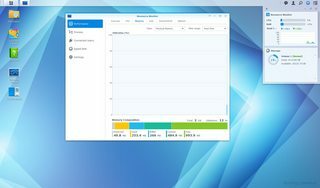 Brief summary of usages: Virtual Drive/Remote folder | Multiple backup options | Mail server | FTP server | Web station | Printer server | iOS/Andriod/Windows phone access | Surveillance | Directory server | VPN server | DHCP server | Time backup | Cloud station | DLNA/uPnP Media server | Download station supports BT/HTTP/FTP/NZB/eMule. 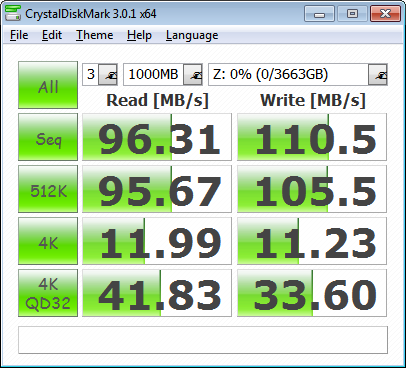 I've kept it concise and will understand this amazing NAS more as I continue to use and test it. 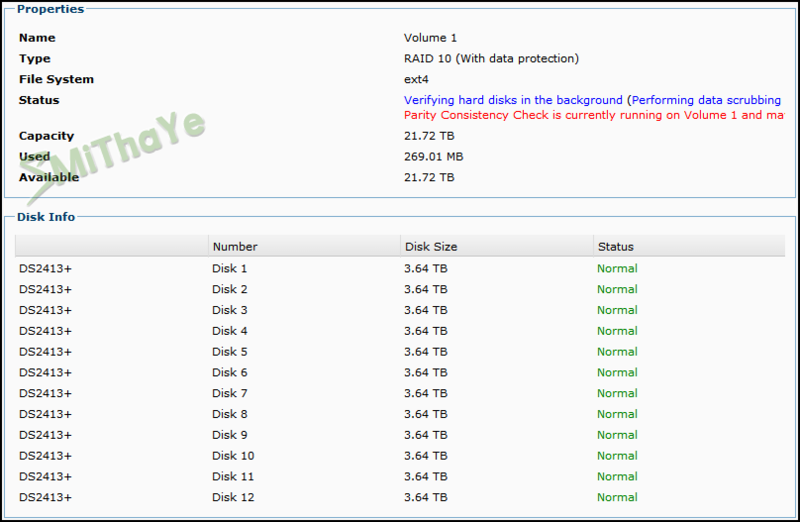 Currently its building a small RAID 1 volume to ensure the HDDs are compatible in RAID and pass the relevant checks. 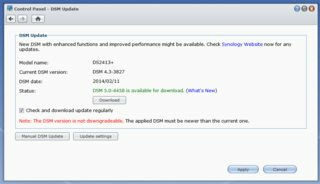 On the 9th March 2014 I updated DSM from the latest available 4.3-3827 (excluding betas) to 5.0-4458. 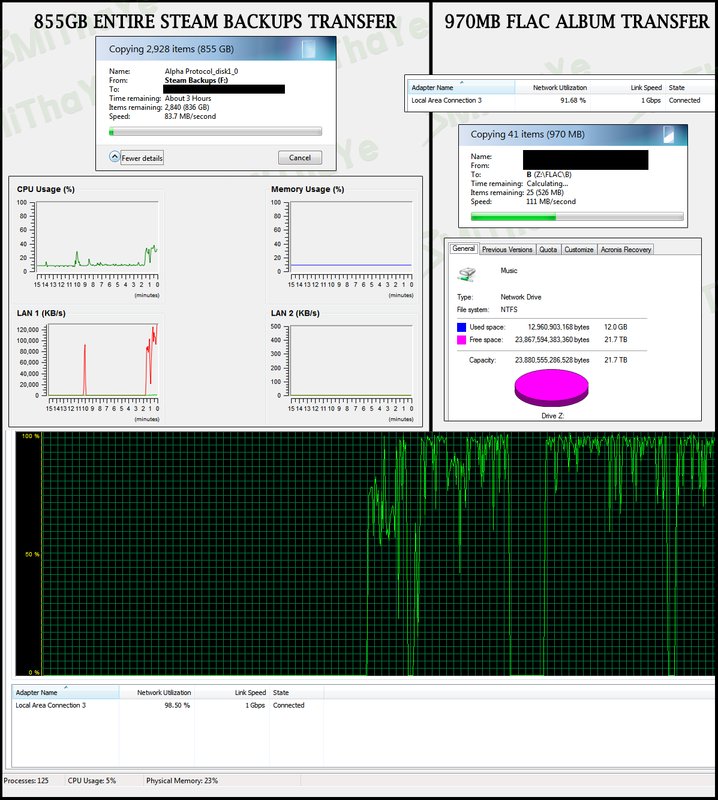 RAM usage is now showing as being more reasonable so either efficiency has improved or reported usage is more accurate. Will keep a check on this over time during heavy usage, I did plan on adding another 2GB module and as things stand can manage without doing so. Update has not changed how I use the NAS as a container for general storage, backups, and accessing media as my own personal cloud or access on living room bluray player via DLNA. 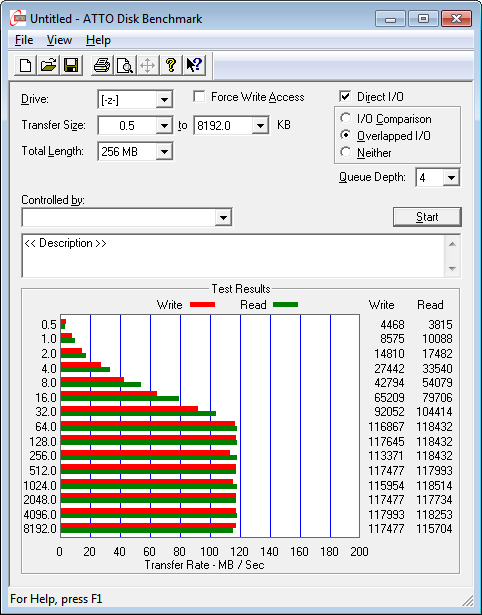 Current usage is about 4.1 TB, DSM calculates this as 19%, some compression must be done as actual figure from the top of head comes to just over 22%. I wouldn't sacrifice RAID-10 for more space, data is too important, I would more than likely use spare 2TB desktop HDDs via eSATA to backup Steam/Origin/uPlay games and when my safe is full upgrade to 4TB - not 6TB as that would carry a premium. That would knock usage in half at least when the rest of the data still taking up by FLAC/MP3/RAW/DNG/JPEGs/MOV or general gameplay footage. This a great piece of equipment. I doubt that there are many typical users who need such device. With a maximum capacity of 48GB (of course you had to go with maximum) it's more like a datacenter, not a personal NAS. I've made a short peak at the features at synology website, the vast majority of them are targeted for business use, like visualization or domain integration. By the way the website also claims that the maximum file system is 108TB, how is that possible? The device supports the capacity, but technically it's not possible to have it? In other words, if there are 8TB drives in the future, it could potentially support it with a new firmware. Looks great. Is this the actual royal baby that I'm hearing all day long? If you don't mind asking, what was the total cost of this setup? And one more thing, from what I've understood, you will mostly use it as a container for videos, later to be uploaded to youtube. Is it possible to automatically upload (transcoded) content directly to yt? lol thanks WhyCry, btw the baby is on the £6k per day maternity ward but short change to the Royal family and now the Queen can go on holiday soon. And have been hearing about this baby all month and haven't been in much lately, lovely weather to be been out and about topping up the tan. What I paid I won't say cos you've already asked once and had been negotiated hard Even so, it was a lot cos the bulk of this was due to the twelve 4TB HDDs.. quickly bought them before the price went up 10%. I will use this NAS for storing all our photos, some videos and lossless audio, docs for work/home. Plus YT videos from my channel that has been taking up a lot of space as you correctly said, not sure about uploading directly from NAS from my little use so far and will re-read the manual later. This NAS isn't a beast for transcoding but you can use the modest CPU for compatibility, ie Audio Station to mp3 for portable devices (more info), to play back local content and you can also disable transcoding (Plex max bitrate or disable streaming). 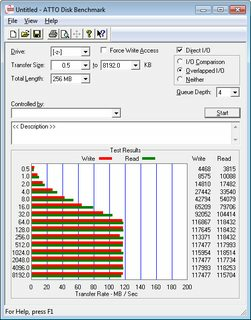 If this CPU transcodes mkv 1080 content I'd be impressed but not essential as most of my movies are on BD/DVD and have an excellent player. Currently the NAS is at 48% volume build complete and disk temps are good at 36c with room at 24c, a delta of 12c for the DS2413+ which is whisper quiet. I like your questions in the different ways of using it cos there's so many options to explore and hope to provide more info as I start to use it daily and find some positive/negative points. It's not a transcoding beast? Well I thought that dualcore NAS could handle that. I don't see a point in spending great amount of money only on a file container. Of course my needs are far different than yours. I would mostly look for a good cloud solution with android support, something like Dropbox. And as much as I love Dropbox I'm not a fan of PRISM, which is supposedly also scanning my files on dropbox. That said I would require very similar solution, but with larger capacity and mkv transcoding directly to TV set. By the way, you have it connected to UPS? We're talking about potential and is still untested for transcoding for me to be specific. If Video Station is as good as what I read its very fast for most 1080p content otherwise solutions such as Plex is much slower and not the fault of the CPU - I'm sure with more updates it'll catch up. A full transcode would only be done if Direct Steam was manually set to "0" or too low a bitrate. Main use is still music, RAW/PSD/JPG photos, occasional videos from camera/S3, and backup of YT content. If you didn't want your stuff scanned use Mega or encrypt your stuff before upload. As for larger solutions, you can't get a bigger NAS currently and if you can fill 48/96TB I'd be amazed as racks with more storage than that would set you back far more than what is reasonable or practical unless you starting leasing spare capacity whilst keeping stum your not a secured premise or have offsite backups. Update: Close to coming online sometime later today... 55 hours and NAS is nearly ready to use after some optimisation, consistency of volume was completed at 12:30 today. Edit: 26th @8AM running an Extended Smart test and setup schedule to test this at the end of every month. Takes ages to check a single disk, estimate it at 6 hours but it is very thorough and necessary for first install to run these checks. Quick post on the performance via the network, DS2413+ is plugged into router - 1Gbps full duplex . No link aggregation for redundancy because I'm not sure if I'll connect to living room via Cat6e or enable wireless to access the folders for music/photos. It'll come down to testing and seeing how stable the adapter really is. The fluctuation in network throughput is down to the various filesizes and peaks with 1GB filesizes from Steam backups. Jumbo Frame is off due to compatibility with wireless devices/switches, this would offer an increase in speeds of only 15% therefore it is left at 1500. With compatible switches it is capable of 9000 but without many clients accessing it at once there is little use for this. And to cover this too, the ext4 filesystem is already optimised and no need for any defrags. I do know that over time the filesystem will slow down to a degree as the blocks next to each other are allocated. 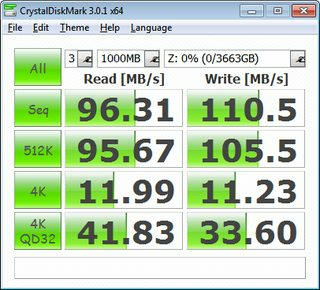 After some time in order to get back peak performance, the recommendation is to copy data safely elsewhere and format/reset the DS2413+ and disks. 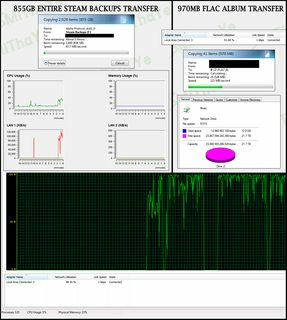 Think of it like quickly Secure Erasing your SSD to restore full read/write speeds by rezeroing the cells/data. Another general point is try not to use more than 90% of available space in a NAS for data integrity/performance - the general speed is due to writing on the outter track where there is a higher data transfer due to there being more data sectors than the inner track and becomes more apparent on slower HDDs as access times increase or write speeds decrease.